We produce prints for outdoor advertising as well as business premises. All our materials are high quality and long life. We offer: vinyl, mesh vinyl, flags, banderols and various fabrics, as well as weatherproof boards. Use: Banners, billboards, bridge railing ads, facades. Better colour rendering than PVC vinyl. Strong and lightweight material. Also available as Speaker version. Thin and translucent polyester flag. Use: Flags, hangers, as a backdrop in a theatre stage. 100% polyester canvas, which is almost wrinkle-free. Flexible. 100% polyester fabric is suitable for banners and in-store advertising. Satinette 115g, 200cm / sublimation / Fire classification B1. Smooth canvas vinyl, suitable for light commercials. Usage: Indoor banners, as a backdrop for a theatre stage, outdoor advertising. Light transmitting by crumpling resistant material. Very durable, 3mm thick vinyl mat. Use: Fairs, lounges, gym mats. Epson eco-solvent prints are nickel-free. For outside use prints will last without lamination UV light for up to 1.5 years. Use: Outdoor Advertising, the edges of a stage. Use: Outdoor Advertisements. Lets through the wind. Use: Election Ads, campaign posters. For outdoor use (up to 3 months). budget, satin-finish poster paper for advertising use. Really thick and rigid light-blocking material. Use: Cooler hides, curved structures for fairs. Matte Sticker 120 gsm. / 137 cm. Permanent adhesive, grey background (can be laminated). Permanent adhesive, white background (can be laminated). Clear, transparent, self-adhesive, printed without the white colour. Suitable for shop windows. Light transmitting (can be laminated). Easy to install and remove, white background. Use: Short-term campaigns, promotions and car Election Ads. Easy to install and remove, transparent background. 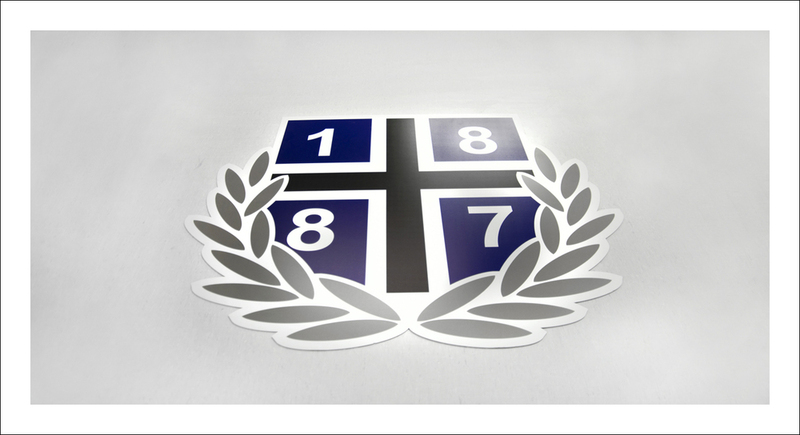 Great product for window advertising and car sales. Available in either a removable EasyDot version or permanent adhesive. Use: Exhibitions and short-term promotions. We also offer the following materials: sewing, heat-sealing’s, eyelets, edging strips, Snap-On mouldings, edge reinforcements and aluminium profiles. White, durable and non-flammable B1 PVC. Application: Signage, outdoor advertising, information boards. Aluminium composite plate with PE-core, aluminium surfaces. Suitable for long-term outdoor use. Dibond ® Class B / EN 13501-1 fire classification. White, matte plate with a polystyrene foam core. Extremely rigid yet lightweight plate. Viscom can be cut in different shapes. Use: Outdoor Advertising, exhibition walls, actual human size cut figures. Acid-free polyurethane foam. Plastic-coated surfaces. Usage: Exhibition Stands, shop decoration and promotion indoors. Light cell plate is a cost-effective alternative. The material is recyclable and can be disposed by incineration. Cell plate can be cut into different shapes. Use: Outdoor Advertisements, put ads, stadiums ads. We also print to customer's own boards.